Uttarakhand, the lake district of India, is one of the most spectacular hill stations of India. The natural landscape here creates the perfect setting for a romantic getaway. Our brilliantly crafted 8 Nights / 9 Days Uttarakhand honeymoon tour lets you visit all the fabulous destinations scattered across the state. Enjoy a trip to this lovely state, and visit places like Haridwar, Auli, Joshimath, Kausani, Mukteshwar, Bhimtal and Nainital. Create some of the best honeymoon memories with a romantic tour to Uttarakhand and cherish those memories for a lifetime. Note: This is just a suggested itinerary indicative of what can be possible. We tailor holidays for your specific needs. Contact us if you want modifications so that we can tailor a holiday to suit your need for an unforgettable India tour. Enjoy magnificent view of the Himalayas from Tiffin Top and Land Ends. Arrive at the Delhi airport; meet our tour representative who helps you with an assisted transfer to Haridwar, by road. On reaching Haridwar in the late afternoon, check in at the hotel. Settle in your room and relax for some time. 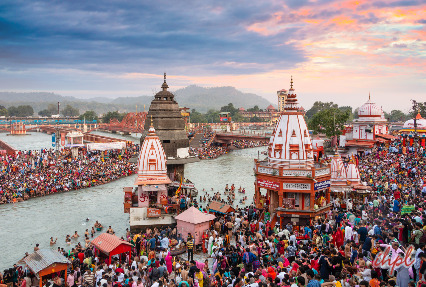 One of the holiest cities of Uttarakhand, Haridwar is known for housing a number of temples and Har-ki-pauri that is a popular ghat (river bank) where people take a dip in the water of Ganga River to wash away all their sins. It is visited by a huge number of devotees every year. Evening is scheduled for Ganga Aarti, on the banks of River Ganges. This is one of the most memorable moments. Admire the site when the shadow of thousand of lighted lamps fall in the flowing holy waters of the river. The whole atmosphere becomes absolutely peaceful. On day 2 in the morning, check- out from your hotel and head straight to Joshimath. As you arrive in Joshimath, get on-board a cable car to reach Auli. The cable car connecting Joshimath and Auli is one of the longest ropeways in Asia (16 km). Admire the mesmerizing views of the Himalayan peaks surrounding you and Oak forests, lying right below, while you are in the cable car. On reaching Auli, complete the check-in formalities at a resort. Enjoy the view of the setting sunset behind the Nanda Devi and other snow- clad peaks from your room. 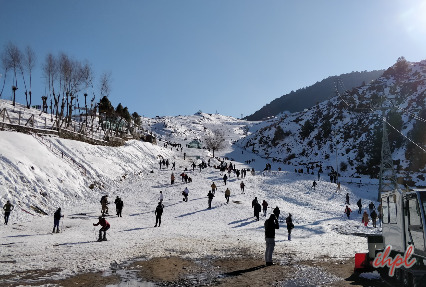 Located at an elevation of 2500 to 3050 meters above sea level, Auli is popular for being a popular Ski destination in India. 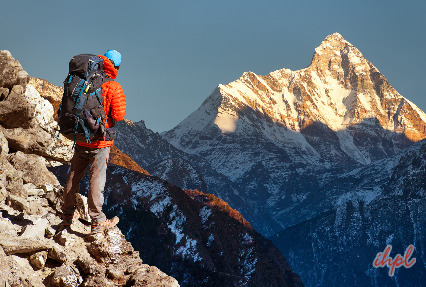 Trekking and skiing enthusiasts from all around the world come to Auli for some lifetime experiences. Later, enjoy dinner and bonfire music. On day 3, post breakfast, move towards the slopes to learn the basics of skiing. The experience is going to be a lifetime experience. If you wish, you can also partake in sledging. Have your lunch at the resort. Thereafter, enjoy a guided trek to Lake Valentine (a man-made lake) through thick pine forests and savor enchanting views of Helang Valley. 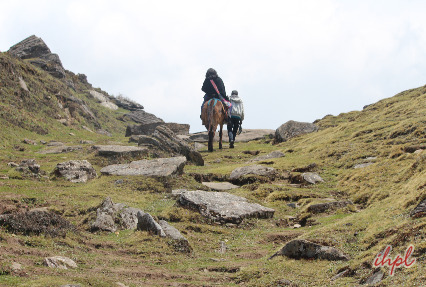 The trek is slightly high on difficulty level and you need to be completely fit to embark on it. You are going to love the mesmerizing views and the cool breeze on your face. Later at night, enjoy bonfire music with dinner. In the morning on the 4th day, set out for a sightseeing tour of Joshimath, the winter seat of Lord Badrinath. 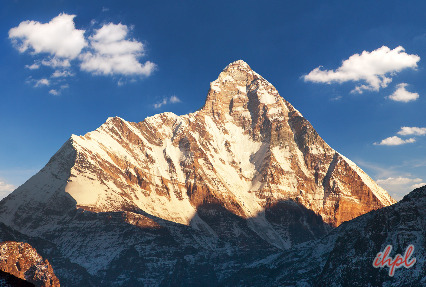 Joshimath is one of the four ‘maths’ (monasteries) that were founded by Adi Shankaracharya. The places you visit here include Narasimha Temple- around 1200 years old, this temple is dedicates to Lord Narasimha, the fourth incarnation of Lord Vishnu that is half-lion and half- man; Shankracharya Cave- near Kalpvriksha, this is sacred cave where Adi Shankaracharya lived and meditated; Tapovan- a popular tourist attraction here that has hot sulfur water springs. It is believed that these the water of these springs have medicinal properties. Later, board the ropeway back to Auli. Enjoy bonfire music with dinner. Stay overnight at the resort. In the morning, leave by road for Kausani. Also known as ‘Mini Switzerland of India’, Kausani is placed at an altitude of 1850 m above the sea level. The serene surroundings, romantic weather, snow-clad peaks, lush surroundings of conifer trees attract a decent amount of tourists from all around. This small hill town is a beautiful one. On arriving in Kausani, check-in at a hotel. After completing the check-in formalities, get to explore this lovely place. Here you will visit Anashkati Ashram- also known as Gandhi Ashram, this was the place where Mahatma Gandhi had stayed for around 2 weeks in the year 1929. He had described the place as the ‘Switzerland of India’. The last visit of the day is to Chai Bagaan or aromatic tea estate of Kausani. Take a stroll here. Enjoy the sunset views over the Himalayan ranges. Overnight stay and dinner. On day 5, head straight to Mukteshwar, your next destination. 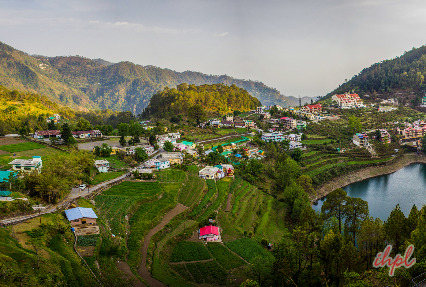 On the way, halt at the beautiful town of Bhowali that is popular for housing the biggest fruit market of the country and then at the mesmerizing hill town of Ramgarh, famed as the fruit bowl of Kumaon. Later, continue to Mukteshwar. Placed at an altitude of 2285 m above the sea level, Mukteshwar is a pleasing hill town with a serene ambiance. The place derives its name from Lord Shiva’s temple, Mukteshwar Dham. Treat your eyes to the mesmerizing scenery and let the cool breeze brush past your face. On reaching, check-in at a hotel. After relaxing for a while, head out to explore the surroundings. Visit Shiv temple, one of the most revered sites here that is also known as Mukteshwar Dham. The presiding deity of this temple is Lord Mukhestwar or Lord Shiva. It is believed that the temple is around 350 years old and Lord along with Goddess Parvati, his son Lord Ganesha and his Vahana (vehicle), Nandi bull. In the evening, witness sunset over the snow-covered peaks. On the 7th day post breakfast, leave by road for Bhimtal. On the way, visit Ghorakhal, famous for Army School or Sainik School (one of India’s best school for students for the officers of cadre of Armed forces) and admire scenic views. 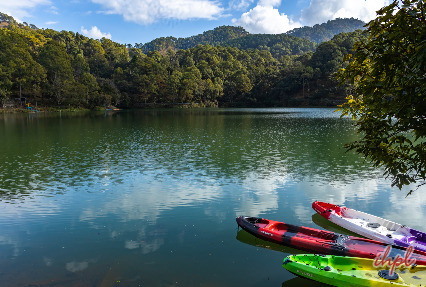 Your next visit is to Naukuchiatal, a Lake with nine corners- bounded by forests and greenery, this magnificent Lake is a popular picnic spot that also offers parasailing as well as boat riding and then to Sattal, an interconnected network of 7 freshwater lakes. You can boat riding and bird watching here. The air around the Lake is very fresh. As you reach Bhimtal, complete the check-in formalities at a hotel. Explore the lush surroundings on your own, as per your liking. Lying at an altitude of 1370 m above the sea level, Bhimtal is a town that houses the picturesque Bhimtal Lake that lies amidst mountains and greenery. On the banks of the Lake is Bhimeshwar Maha Dev temple that is believed to have been built by Bhima, one of the 5 Pandava brothers of Mahabharata. It was later renovated in the 17th century by Baz Bahadur of Chand Dynasty. Overnight stay and dinner in Bhimtal. In the morning, head straight to Nainital, one of the most popular hill towns in Uttarakhand. Located at an altitude of 1938 m above the sea level, Nainital is quite famous for its lakes. Upon reaching check-in at a hotel. After settling-in, head out for a sightseeing tour of Nainital. Here you visit Khurpataal- this small hamlet around12 km away, it has crystal clear lake and a pleasant climate; Hanuman Mandir or Hanuman Garhi- constructed by a popular local saint Neem Karoli Baba around 1950, this temple is dedicated to Lord hanuman; Nainital Waterfall- around 5 km away, this is fall has white milky water and ARIES Observatory- founded in 1955, it is a popular attraction here. Later, take delight in cable car ride to Tiffin Top- admire nice views of the surroundings and the Lake and then boating in the very popular Naini Lake. In the evening, do not miss shopping at the Tibetan market/Bhutiya Bazaar and Mall Road. Today, you on-time transfer to Delhi International Airport to board flight for onward destination.